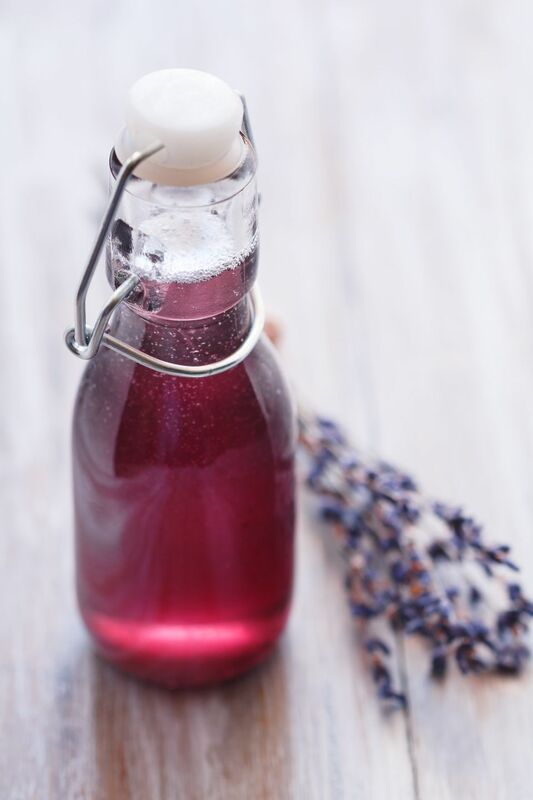 Simple (or sugar) syrup can easily be enhanced with your favorite herbs, such as lavender. This little purple herb is ideal for adding an aromatic, light botanical flavor to any drink and will immediately transport you to a garden in spring. Bring the water and lavender to a boil. Stir in sugar until fully dissolved. Pour into a bottle and keep in the refrigerator. It will store well for about 2 weeks. The recipe makes a very sweet syrup and will yield just over 1 cup. If you would like to make more, simply double or triple all of the ingredients. When choosing your lavender, use buds that have not opened and flowered completely - for the best aromatic qualities, go for the buds that are fully purple but still tightly wrapped. You can also use dried lavender, which can be found at most natural food grocers. If you like, add rosemary to this syrup. The two herbs are perfect companions and the combination can be used in any drink that calls for one or the other. Lavender Honey Simple Syrup: Honey can be used as a portion of the sweetener for this syrup. It adds a darker background for the bright florals and is perfect for mixing into drinks with whiskey, rum, and other dark spirits. To make the syrup, bring 1 cup water and 1 tablespoon of lavender flowers to a boil. Add 1/2 cup sugar and 1 cup honey and stir until they have dissolved. Reduce the heat and simmer for 15 minutes before removing from the heat. Allow to cool, then strain and bottle.